This PDF 1.6 document has been generated by Adobe InDesign CS5.5_J (7.5.3) / Adobe PDF Library 9.9, and has been sent on pdf-archive.com on 24/12/2015 at 15:39, from IP address 5.18.x.x. The current document download page has been viewed 290 times. Measure even on paved roads. 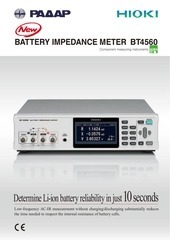 3-electrode measurement on the 3151 gives greater precision! 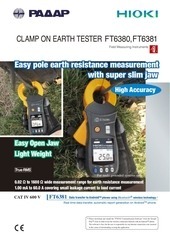 used to measure ground resistance on paved roads. 1. Wire as shown in the diagram. 2. Turn the rotary knob to measure. displayed is the grounding resistance value. ■	Measurements are easy to read. A large digital display shows measured values. 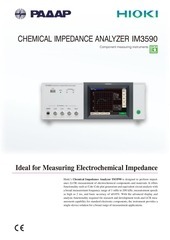 inductance of the measurement cable. 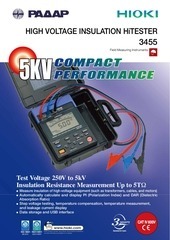 measurement terminals, and Ro is the signal source output resistance. Bar graph display makes it easy to find measured resistance. Turn the rotary knob so that the graduations are centered. resistance using a frequency between 500 Hz and several kHz. these instances, we recommend using Model 3151. •	Electrical grounding or mesh grounding. 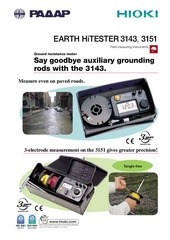 •	Electrical power equipment grounding. insertion point of the grounding electrode. Take measurements to 115% of the measurement range. provided by an alarm buzzer and overvoltage protection. have increased dust resistance and durability. 1. Wire as shown in the diagram. and P in the auxiliary grounding resistance range. 5. Measure using the appropriate resistance range. 4. Take measurements, choosing either ×10 or ×100. (commercial power supply grounding), and warns of incorrect connection by buzzer. which can cause measurement error. Push a button to select simple measurement (two electrode method). 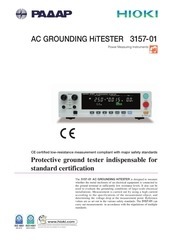 of grounding voltage or grounding current due to high power supply frequency. This file has been shared by a user of PDF Archive. Document ID: 00326465.